The social network Openbook could be the perfect alternative to Facebook. It should remain ad-free, does not collect user data and exposes its source code. The test phase has begun, the public beta should start soon. Most of its users know that Facebook is anything but free. They pay with their data, and not too tight. All posts, photos, likes, comments, visits to other websites, purchases, activities, friends, preferences, and more will be evaluated and stored to help users see the right ad. This works so scary now that Facebook is even under suspicion to eavesdrop on conversations. And how easy the company deals with user information, showed, among other things, the Cambridge Analytica scandal and stored in plain text access data . Nevertheless, most users remain loyal to the social network because they do not see any alternatives. But there are, for example, the crowdfunding project Openbook , which does not want to collect user data, wants to be open, transparent, free and secure. The public beta is about to begin, but supporters who have contributed to Kickstarter can now network. An editor of ” Golem ” is there and so far especially pleased by the pleasant tone. Whether the anti-Facebook future has, but he can not say yet. A big hurdle from the start is funding for Openbook. So founder Joel Hernández made a crash landing with his first crowdfunding attempt because he had set the funding target too high. The second attempt was all well and for the supporters, the network is now online for about three weeks. According to “Golem” the concept of Openbook resembles less Facebook than that of the failed Google+. Central are the communities that users can join and join forces with like-minded people. Posts posted there appear in the timeline of all community users. In addition, members can follow each other or connect with each other. Such acquaintances can be organized in non-public circles – so you stay with yourself. Big difference to Facebook: Openbook uses no algorithms to weight contributions in the timeline of users differently, they are simply displayed chronologically. It still does not work perfectly, the different levels of Openbook are a bit confusing, writes “Golem”. 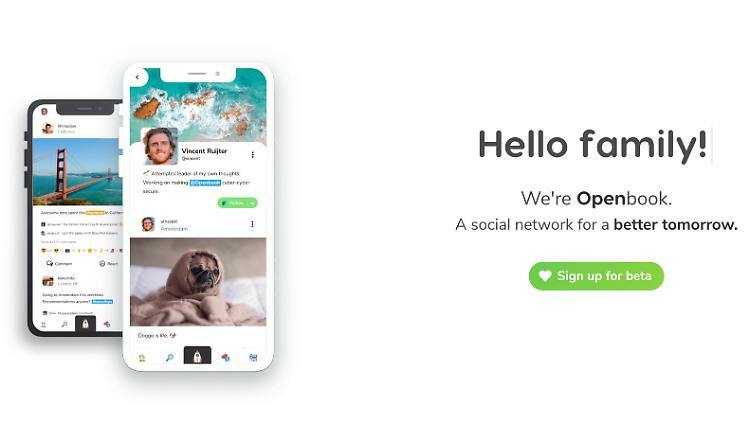 For example, on your own profile page, you would only see your own posts that a user shared with their circles – not the posts posted in the communities. However, Hernández and his small, eight-member team use the closed test phase with just a few participants to correct such errors and improve the source code until the open beta. The code is to be published later so that it is controllable and no one has to fear secret backdoors. To avoid wasting resources, Hernández does not use a web client and focuses on iOS and Android apps. This probably also corresponds to the target group, which mainly uses smartphones or tablets for social networks. In order to stay in control, over 1,500 Kickstarter supporters already active receive 10 invitations to share in April. Then again mistakes should be corrected and suggestions of the users implemented before the next invitations go out. You can also sign up for the beta and land on a waiting list. Also on the topic of fake news OpenBook does not want to follow the bad Facebook example. “All content posted in a community is moderated and these public feeds will never show posts published on a user timeline,” Hernández said in an interview with Golem. In addition, Openbook works on tools that users can use to report problems. It is envisaged that a post will be made invisible as soon as a certain number of users have reported it. Then he should be checked by moderators. In addition, the invitation system should prevent abuse, blocked users can not come back without a new invitation back to the net. Does a subscription model work? Even with modest growth, further funding becomes problematic. Hernández is planning a subscription model that will allow users to get access to additional emojis, special avatars, themes or other benefits for 5 euros per month. However, free users should not have to fear real restrictions, especially with regard to data protection and security. Whether the concept will work out will become apparent in the coming months. PREVIOUS POST Previous post: Juhu, she will be mom for the first time!